There's been thousands of embarrassing Detroit Lion's performances but last night's season opener 48-17 home loss to the New York Jets might take the cake as the worst ever. Not only did Matthew Stafford (5 INTS) get completely outplayed by rookie Sam Darnold in his NFL debut but then we had a real life scuffle in the stands between two fans wearing a jersey of a player who couldn't take playing for the Lions anymore and quit the game. I mean it's so Detroit it's not even funny. Actually it kind of is funny just because the punches being thrown look so slow it's like watching the Lions play back in the 50's when only whites were allowed to play. Well at least Detroit made some history last night. This has to be the first time in recorded history to fans wearing the same player's jersey got in a fight with each other. Next time maybe fight with some of the Jet's fans there fellas. BUY THE ORIGINAL ANN ARBOR IS A WHORE SHIRT HERE! Was Nebraska QB Adrian Martinez's injury the result of a dirty play? Was Adrian Martinez's injury a dirty play? You be the judge. Some in Huskers Nation are not happy about Saturday's game vs Colorado and it's not entirely about head coach Scott Frost's first loss in his debut. Freshman sensation Adrian Martinez made his collegiate debut too in Lincoln on Saturday and was having a spectacular game until he was injured late in the 33-28 loss. Up until the injury on his right knee Martinez had rush for 117 yards and two scores while completing 15-of-20 passes for another TD and an interception. Trying to rush to his right on a design QB run Martinez was hit and wrapped up by Colorado LB Jacob Callier. While on the ground it appears Callier tries to twists Martinez's lower right leg while putting extra weight on it. It was noticeable enough for Frost to question Callier's intentions during the play. Not a good look for Colorado but still it's hard to say without a doubt Callier meant to injure Martinez. But don't tell that to Nebraska fans. They already have a "Wanted" graphic for Callier for malicious intent to do harm! Gotta love college football hysterics and that call number to report Callier. (303) POS-BUFF no doubt has been called hundreds if not thousands of times by now to some poor soul smoking a bowl in Boulder who has no idea what happened in Lincoln on Saturday. FWIW the injury to Martinez's knee is being classified as day-to-day and it appears at this time he escaped major injury. Frost will now have a walk-on start at QB until Martinez is ready to play. 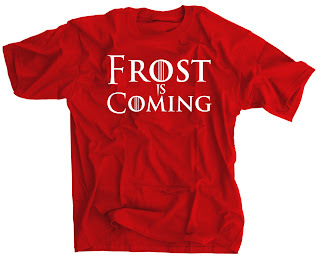 BUY FROST IS COMING NEBRASKA SHIRT HERE! If you don't think SEC schools take their football serious I give you this fight at the Grove from Saturday as another example of football being so serious that is can cause outright anarchy. Ole Miss was down at half to Southern Illinois. The Salukis should never be leading Ole Miss in football much less going into halftime. Fans in the Grove were not taking it lying down so to speak and wanted to fight for their team amongst themselves. Mix in some brown liquor, high temperatures, losing football, and high levels of angst and you got a boiler keg of emotions spilling out for all to see. Golf polos and khakis shorts were seen flying everywhere. Croakies, Ray Bans, and Sperry's scattered like limbs in Normandy. This was Civil War part deux in Oxford and no tailgate tent was safe. Precious feathered bangs were left rustled. GET YOUR DRINK LIKE A CHAMPION TODAY SHIRT HERE!